“India is a fast developing country and its real strength is our energetic youth, who are talented and able to compete on world level in every field”, said Mr. Deepak Vohra, IFS (Retd. ), Advisor to the Prime Minister of the Kingdom of Lesotho. He was speaking as the keynote speaker in an Expert Talk on 'Global Megatrends' at Desh Bhagat University under the series of Induction Programe. This lecture was especially arranged for the students to boost up their morale and to encourage them to contribute to country’s development. University Chancellor Dr. Zora Singh inaugurated the event by lighting the ceremonial lamp. While welcoming the learned speaker, Dr. Zora Singh said, “In today's fast moving era, everything is changing very speedily and to become a strong & developed country, we have to get rid of all our weaknesses”. It’s time of innovation, smart technology and latest techniques, and it is the responsibility of the students to contribute and make our country sound and strong on the world map, he added. While addressing the students, Mr. Deepak Vohra discussed in detail about the Global Mega-trends in different fields like Infrastructure, Renewable Energy, IT, Science and Technology, Economy, E-Governance etc. He said, “At present all developing countries are looking towards us because India has maximum youth population of the world and our youth has the potential to take our country on the top in the near future”. 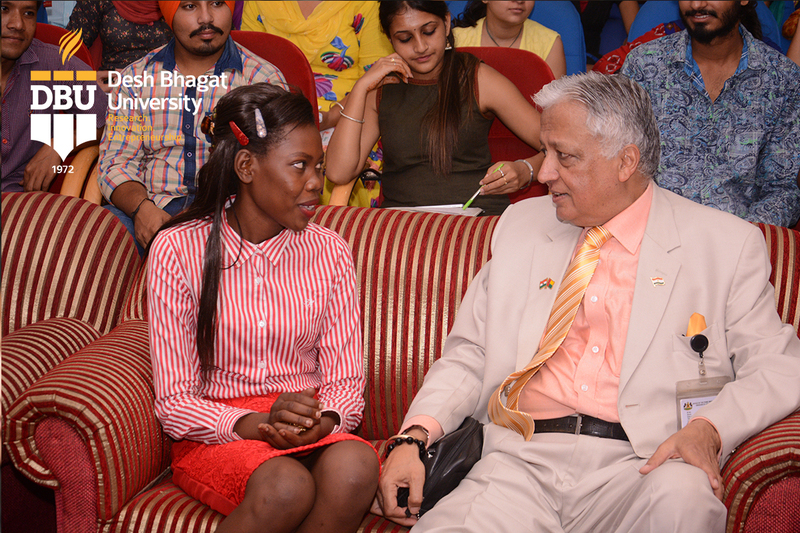 Mr. Vohra encouraged the students to grow up in Indian Spirit and follow our own rich and glorious culture rather than adopting western culture. 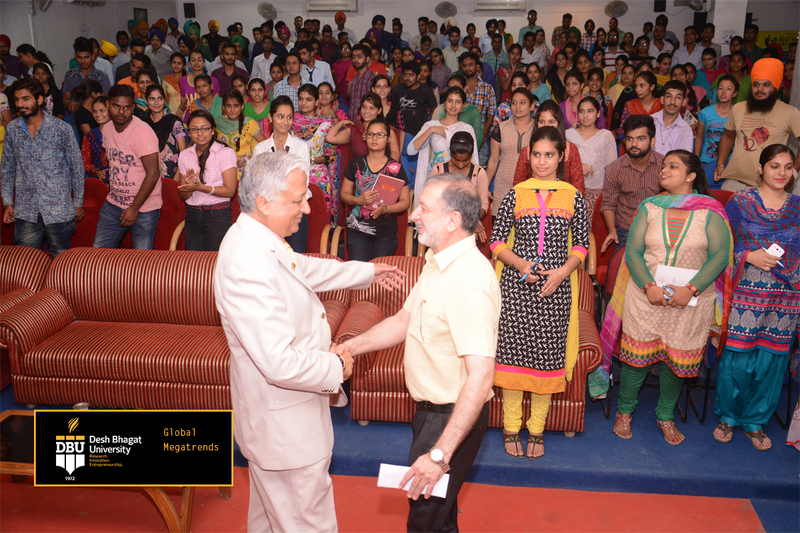 He exhorted the students to become proactive in every field and do personal audit every day before go to sleep. He also answered the questions put by the students and satisfied their queries. Desh Bhagat University Vice-Chancellor, Dr. Shalini Gupta said that such events are very useful for the young generation, especially the students. It will help them in their multi-functional growth. 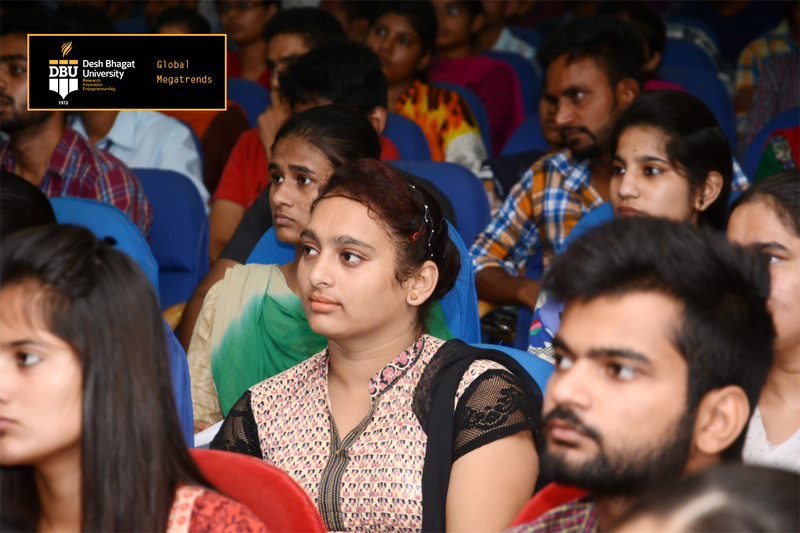 At the end of the programme, she thanked the learned speaker for sparing his valuable time for the students and hoped that it will prove quite useful for them and the faculty members too. Registrar Dr. Virinder Singh, Controller Examinations Dr. I.S.Sethi, Director Dr. Surjit Patheja, Director (Academic), Dr. Rajesh Goyal, large number of students from different faculties and faculty members were also present on this occasion.